The 2nd Generation kickstand4u™ Smartphone kickstand with the same sleek design with the Sure Grip™ feature now available! Check out the new skins! The 2nd Generation with the same sleek design will allow the blade to separate and will have the Sure Grip™ feature. Hands Free Viewing Anywhere when you Need It! 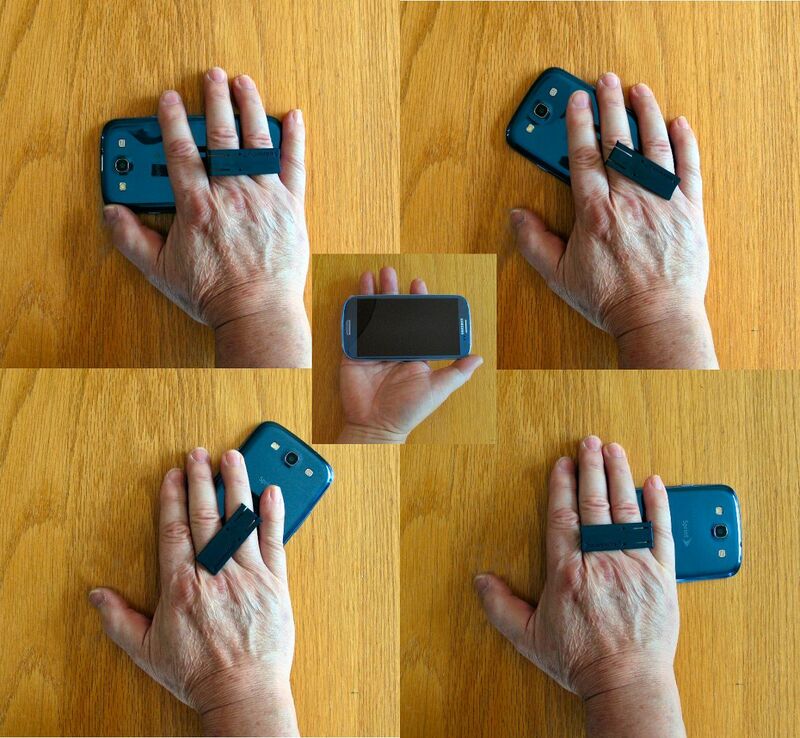 Sure Grip™ - open up the kickstand blade and slip your fingers thru to easily hold your device in any comfortable viewing position - See full animation of Sure Grip™. 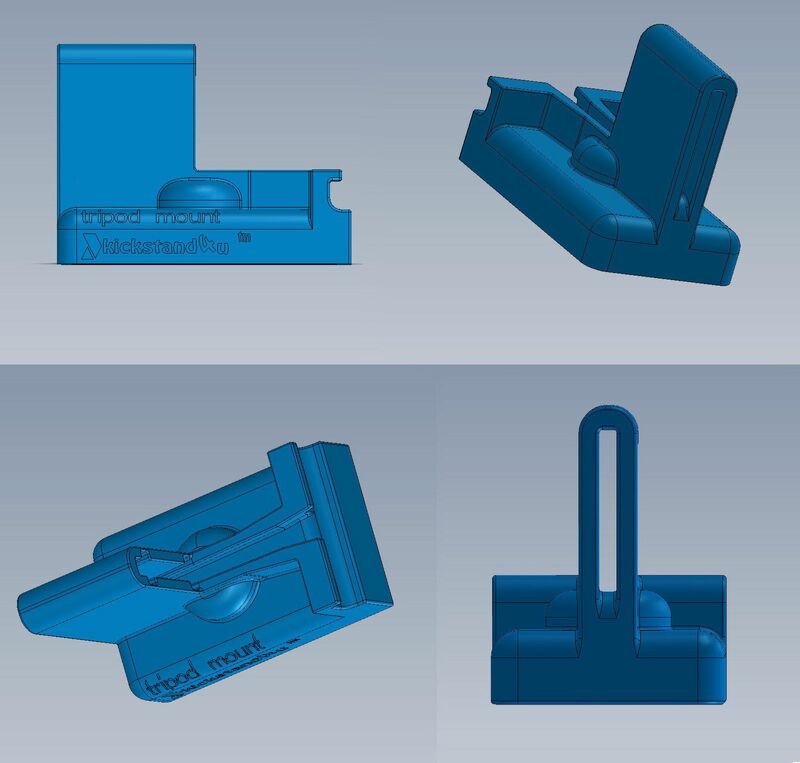 Tablet Extender™ Slipped onto the kickstand4u™ mobile phone kickstand blade - CAD Drawing - See different Tablet Extender™ examples. 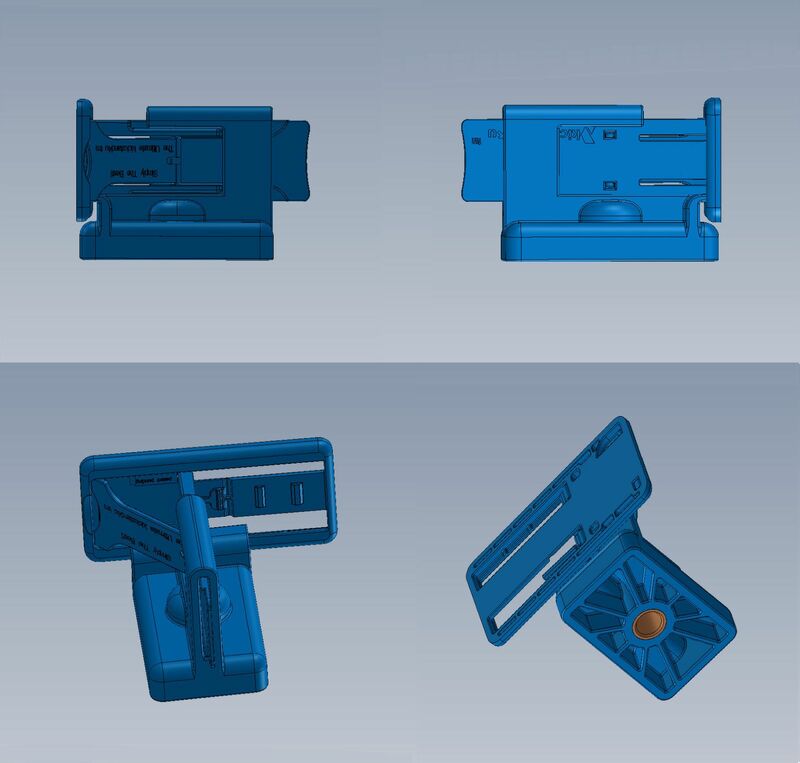 Tripod Mount - Multi Angle View - CAD Drawing - See full animation of Tripod Mount. 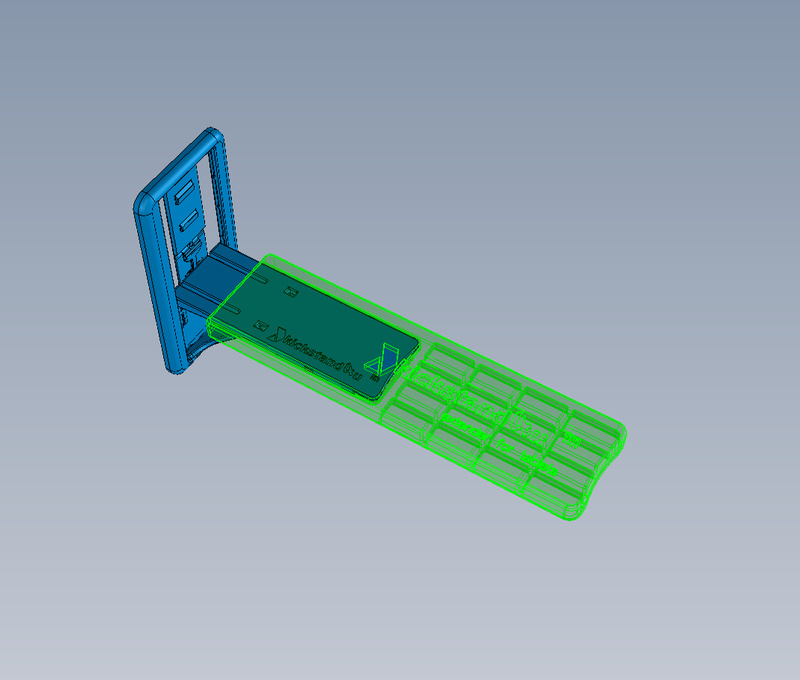 Tripod Mount with kickstand4u™ mobile phone kickstand inserted - Multi Angle View CAD Drawing - See full animation of Tripod Mount with kickstand blade inserted. 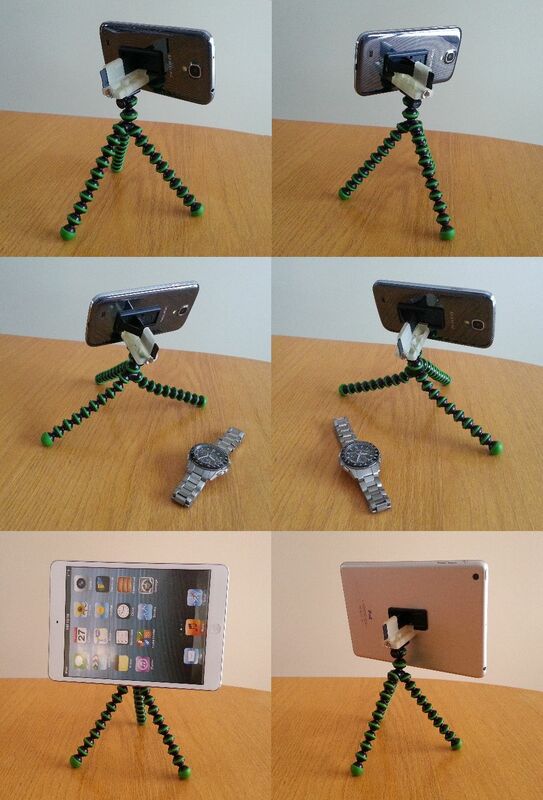 Fantastic way to get Super Sharp pictures from any mobile device. 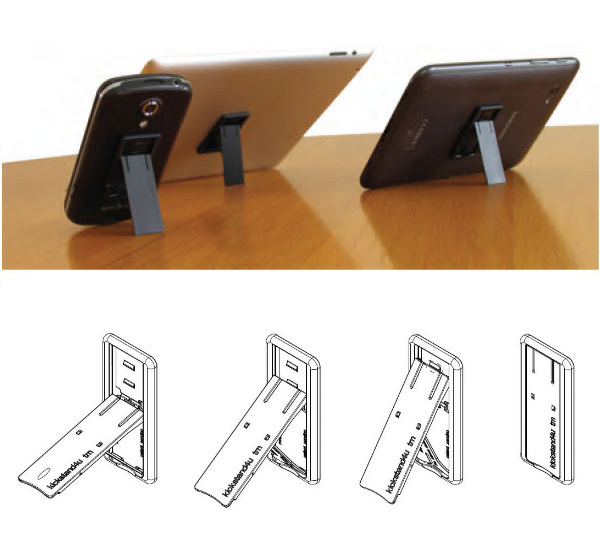 kickstand4u™ smartphone kickstand with Sure Grip™, is a Patent(s) Pending Design. Lightweight, comfortable, "barely there" accessory. It is the only one of its kind. A Universal One Size Fits-All mobile device kickstand with Sure Grip™ and the optional Patent(s) Pending Slip-on Tablet Extender™ and Tripod Mount. The above will fit all smartphones, small, medium, and large tablets, e-book readers, iPods, iPhones, and iPads (larger and heavier tablets may need two). Works with or without a case, and easily removable without damage to the attached surface using the standard adhesive, or the 3M Command Strip System. Making it easy and safe to move from device to device if needed. No need to carry another bulky accessory piece around, or trying to find a way to lean your mobile device against something for a stable and comfortable hands free viewing angle. Completely adjustable in both Portrait and Landscape positions to ensure perfect stable viewing angles of your choice on any mobile device or tablets in a one size fits all package. 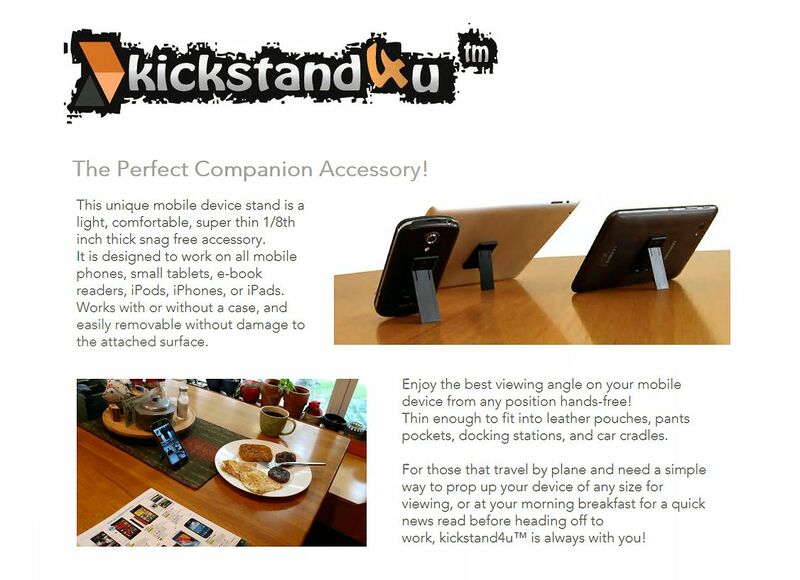 • kickstand4u™ smartphone kickstand Buy It Now!